The bodywork has been worked on to bring in HID projector head lights, cowl induction style scoop, and concave flared fenders that mold into a one piece rear end. Brunton Stalker M-Spec, new front end updates inclide HID projector head lights. The rear body work has been lengthened by 5 inches in height creating a pleasant and aggressive profile to the car. It also promotes a feeling of safety and comfort sitting �down in the car more�. The rear fenders are now joined in a one piece construction with the rear end of the car. It sports a dramatic concave fender flare that blends in with the rear of the car. The new frame construction accommodates updated front and rear suspension for road and track setups. Brunton state "The Stalker M-SPEC suspension was designed for the flexibility of multiple size tires and more desirable wheel size choices. We choose to use 17� x 9� wheels holding 255-45-17 tires for the street and 13�x10� wheels for the track. The track width was also increase in the front to match the rear providing more stability in corners. " "The front suspension features modified Mazda spindles with zero scrub radius. It also sports a Coleman Racing steering rack with customizable ratios. The control arms have Three vertical mounting locations allowing you to raise and lower the car with-out changing suspension dynamics or the ability to change roll center locations without changing ride height. The steering rack is also very easily adjusted up and down with these changes to eliminate any bump steer that would occur from moving lower control armpositions. Shocks are connected via pushrod/rocker arm. This advantage allows for a longer shock and more dampening control for small suspension movements resulting in a smoother ride and better traction on bumpy surfaces. The rocker arms also allow for Four different motion ratios to fine tune the spring rates for race and street driving. This setup is also more aerodynamic and minimizes un-sprung weight." 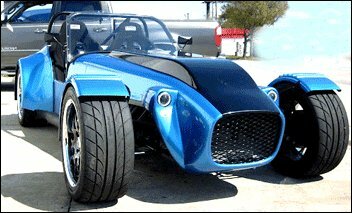 "The rear suspension features modified Mazda spindles and a double wishbone setup. The differential is sourced from a Cadillac CTS or CTS-V. 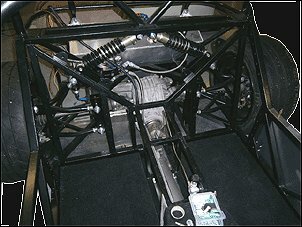 The shocks are connected via pushrod/rocker arm to use a maximum amount of shock dampening. The rear rocker arms are setup for Three different motion ratios to fine tune race and street driving. The control arms have Four vertical mounting locations to raise or lower the car with-out changing suspension dynamics or to adjust roll center with-out changing ride height. The rear control arms are made from 1� .095 chrome moly and use a 5/8� shank spherical bearing attachment."